The Scottish Government is firmly committed to equality for disabled people and is striving to create a Scotland that is fair and inclusive to all. 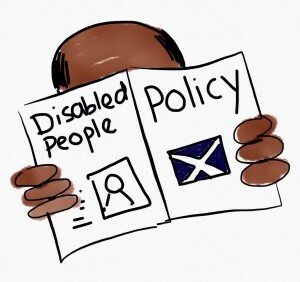 Disabled people make up approximately one fifth of Scotland’s population, yet often experience high levels of inequality compared to non-disabled people. Employment rates vary greatly according to the type of impairment a person has. Disabled people with mental health problems have the lowest employment rates of all impairment categories at only 21%. The employment rate for people with learning disabilities is 26%. How we live and what effects how we live changes frequently due to many factors in society. That’s why the policies that govern how we live have to be reviewed regularly. When the UK or Scottish Government, or other bodies decide to make changes to these policies, it is vital that people give their thoughts and opinions on how these proposed changes will affect them.